Modern city living is forcing urban professionals to look at sleeker, smaller interior furnishings and appliances to make the most of their space without sacrificing style. There has been an important shift in design requirements as professionals move into miniscule living units but desire smarter, better functioning and more stylish electronic devices. “This changing need is driving a new approach to the traditional manufacturing of fridges, washing machines, ovens, TVs and even utilities such as air conditioning units. Samsung designers have long realised that modern appliances cannot be allowed to clutter the living space, instead they should complement the décor, take up minimal space and offer a broad range of advanced technological features that enhance the life of the consumer,” says Michael McKechnie, Director: Consumer Sales at Samsung South Africa. Samsung’s 360 Cassette air conditioning unit is an example of how the company approaches space-saving and aesthetically pleasing interiors. The air conditioner features an omni-directional airflow emission, which eradicates cold air drafts and increases cooling efficiency for a truly premium experience. In addition to its superior performance, the 360 Cassette air conditioner boasts an elegant circular design and is ceiling mounted, leaving much-needed floor or wall space free. In the past, some conventional indoor air conditioning systems posed problems to interior design, a component that has a big effect on the way we interact with and perceive our surroundings. As a bladeless, circular system, the 360 Cassette blends in naturally with its surroundings while providing a stunning finishing touch. The curved design of the 360 Cassette also complements the styles of modern architecture. As interiors increasingly become bolder and more modern, often incorporating curved lines in their designs, the 360 Cassette, which integrates smooth, natural curves, easily melds with the décor of a variety of contemporary spaces. 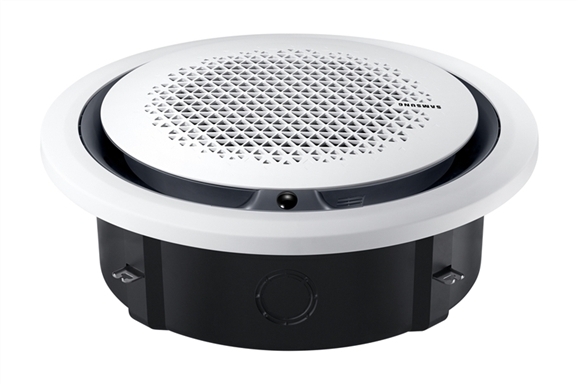 The compact and power-efficient Samsung 360 Cassette received the Product Design award at the IF Design Award 2016 and was a star at the ARBS Exhibition in Melbourne, drawing tremendous attention and interest from engineers, architects, consultants and installers. “Products such as the 360 Cassette air conditioning unit demonstrate that industry-leading functionality, premium design and energy efficiency are still possible within the space constraints of cosmopolitan lifestyles,” concludes McKechnie.